The extrafloral nectaries of Pachycereus gatesii appear as tiny red bumps just below the areole. It’s hard to think of a group of plants that are better defended than cacti. Frequently and often elaborately adorned with vicious spines, these succulents make any animal think twice about trying to take a bite. And yet, for some cacti, spines don’t seem to cut it. A surprising amount of species appear to have taken their defense system to a whole new level by recruiting nature’s most tenacious bodyguards, ants. Plants frequently have a friend in ants. Spend some time observing ants at work and it’s east to see why. These social insects have numbers and strength on their side. Give ants a reason to be invested in your survival and they will certainly see to it that nothing threatens this partnership. For cacti, this involves the secretion of nectar from specialized tissues called extrafloral nectaries. Extrafloral nectaries are not unique to cacti. A multitude of plant species produce them, often for similar reasons. Ants love a sugary food source and the more reliable that source becomes, the more adamant an ant colony will be at defending it. The odd thing about cacti is that they don’t seem to have settled on a single type of extrafloral nectary to do the trick. In fact, as many as four different types of extrafloral nectaries have been described in the cactus family. Ants visiting the extrafloral nectaries covering the developing flowers of Pilosocereus gounellei. Some cacti secrete nectar from highly modified spines. A great example of this can be seen in genera such as Coryphantha, Cylindropuntia, Echinocactus, Ferocactus, Opuntia, Sclerocactus, and Thelocactus. Such spines are usually short and blunt, hardly resembling spines at all. Other cacti secrete nectar from regular looking spines. This adaptation is odd as there does not seem to be anything special about the anatomy of such spines. Examples of this can be seen in genera such as Brasiliopuntia, Calymmanthium, Harrisia, Opuntia, Pereskiopsis, and Quiabentia. Still others secrete nectar from highly reduced leaves that are found at the base of where the spines originate (the areole). Such leaves have been described in Acanthocereus, Leptocereus, Myrtillocactus, Pachycereus, and Stenocereus. They aren’t easy to recognize as leaves either. Most look like tiny scales. Finally, the fourth type of extrafloral nectary comes in the form of specialized regions of the stem tissue. 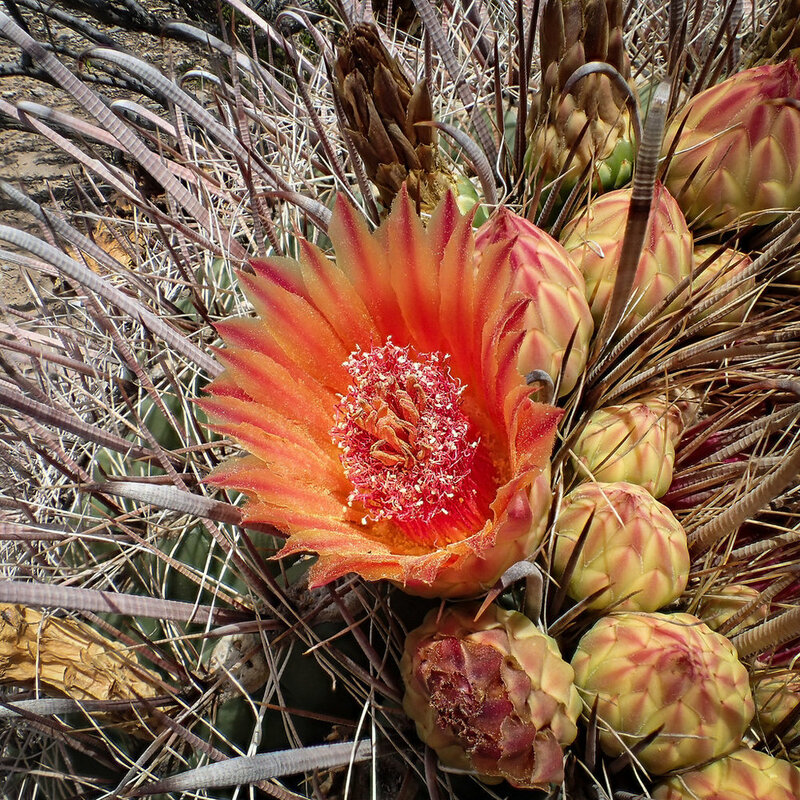 This has been described in genera such as Armatocereus, Leptocereus, and Pachycereus. Highly modified spines functioning as extrafloral nectaries in Ferocactus emoryi. Seemingly normal spines of Harrisia pomanensis secreting nectar. Regardless of where they form, their function remains much the same. They secrete a form of nectar which ants find irresistible. The more reliable this food source becomes, the more aggressive ant colonies will be in defending it. This is an especially useful form of defense when it comes to small insect herbivores. Whereas spines deter larger herbivores, they don’t do much to deter organisms that can just slip right through them unharmed. Ants also clean the cacti, potentially removing harmful microbes like fungi and bacteria. Though we are only just beginning to understand the depths of this cactus/ant mutualism, what we have discovered already suggests that the relationship between these types of organisms is far more complex than what I have just outlined above. For instance, it may not just be sugar that the ants are looking for. In arid desert habitats, water may be the most limiting resource for an ant colony and large, succulent cacti are essentially giant water reservoirs. The key is getting to that water. One study that looked at a species of barrel cactus growing in Arizona called Ferocactus acanthodes found that as spring gives way to summer, the concentration of sugars secreted by the extrafloral nectaries decreases. As a result, the nectar becomes far more watery. Amazingly, ant densities on any given barrel cactus actually increased throughout the summer, despite the fact that the nectar was being watered down. Ants are notoriously prone to desiccation so it stands to reason that water, rather than sugar, is the real prize for colonies hanging out on cacti in such hot desert environments. The incredible floral display of Ferocactus wislizeni, a species whose reproductive efforts are affected by the types of ants they attract. Another interesting observation about the cactus/ant mutualism is that it appears that the identity of the ants truly matters. Though defense is the main benefit to the cactus, research suggests that there is a tipping point in how much such defenses benefit cacti. It has been found that although cacti initially benefit from anti-herbivore and cleaning services, extra aggressive ant species can actually drive off potential pollinators. At least one study has shown that when less aggressive ant species tend cacti, they produce more fruits and those fruits contain significantly more seeds than cacti that have been tended by extremely aggressive ant species. This is especially concerning when we think about the growing issue of invasive ants. As more and more non-native ant species displace native ants, this could really tip the balance for some cactus species. Despite all of the interesting things we have learned about extrafloral nectaries in the family Cactaceae, there are so many questions yet to be answered. For starters, we still do not know how many different taxa produce them in one form or another. It is likely that closer inspection, especially of rare or poorly understood groups, will reveal that far more cacti produce some type of extrafloral nectary. Also, we know next to nothing about the anatomy of the different types of nectaries. How do they differ from one another and how do some, especially those derived from ordinary spines, actually function? Finally, do these nectaries function year round or is there some sort of seasonal pattern to their development and utility. How does this affect the types of ants they attract and how does that in turn affect the survival and reproduction of these cacti? For such a charismatic group of plants as cacti, we still have to much to learn.